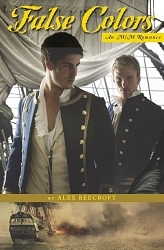 Today my guest is Alex Beecroft, best known as a writer of Age of Sail romances but with some other very impressive strings to her bow in the form of contemporary romance and fantasy. 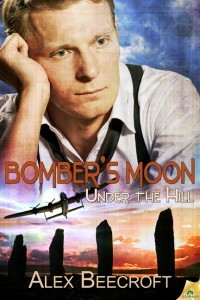 Her latest offering, Under the Hill: Bomber’s Moon, has already garnered some fabulous reviews. I finished it in the wee hours of this morning and can assure you that they are very well deserved! I loved it – and now I have to wait a month to find out what happens next! No point in whining – I knew it was a two parter, but I couldn’t wait until May to read it all in one go. Elin: Bomber’s Moon – and may I say what a lovely evocative title THAT is? 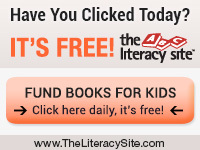 – is a story involving the incursion of Elfland into 21st century Bakewell. Would you expect that some readers will be thinking about Orlando Bloom as Legolas and saying “Oh cool” rather than grabbing for cold iron and shutting themselves in the cupboard under the stairs? Should we blame Tolkien for this? Mixed bunch of denizens of Elfland. Alex: Yay, I’m glad you like the title. I’m terrible at titles, so I threw the task of thinking of something good over to my friends on Livejournal. I think it was Snakey who came up with “Under the Hill.” Then when I found out it was going to come out in two parts the UtH part said “fairies” and I chose Bomber’s Moon and Dogfighters to suggest the WWII part. Heh, watch me not actually answering the question. Sorry! Hm, I don’t know about the whole Tolkien elf thing. I suspect that anyone likely to be attracted by the idea of a book with elves will also have read Terry Pratchett’s “Lords and Ladies.” (Which, in my opinion goes too far in the opposite direction.) Most elf-fans will have read a number of other books where they are depicted as much more ambivalent than Tolkien’s. Also let’s not forget that even Tolkien’s elves were rather inclined to throw passing dwarves in dungeons first and not bother asking questions later. I think there are enough paranormals out there featuring elves rather than vampires/werewolves that people are probably accustomed to the fae folk being tricky and dangerous as well as beautiful and noble. 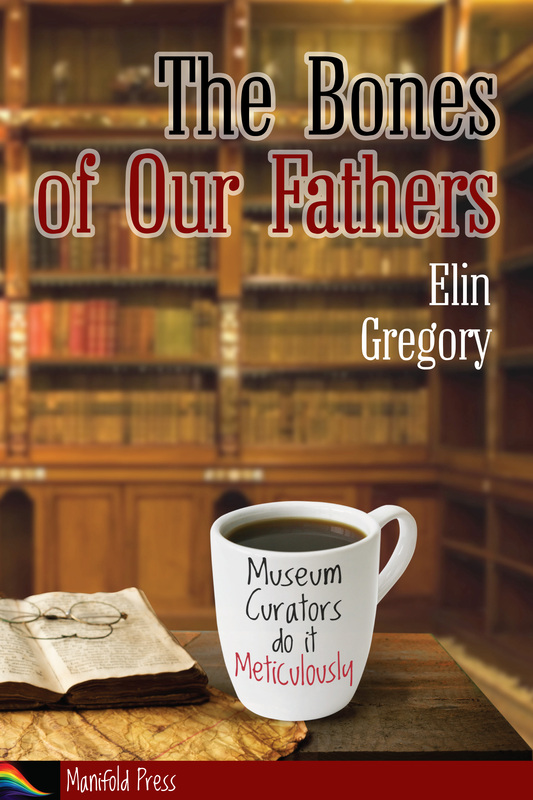 Elin: Chris Gatrell is one of those characters who leaps off the page into the mind’s eye, sleeveless wooly pully and all. Do you have a crisp mental picture of him or is he more a thought and a feeling than an image? Alex: *g* Chris is where Under the Hill all started; I was watching Dr. Who one day. 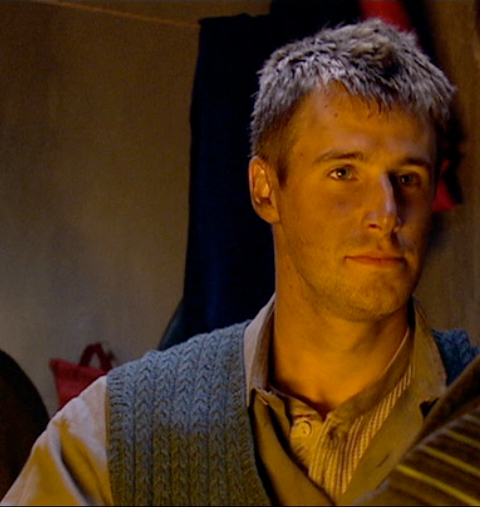 The Doctor was at the end of the universe with Martha and Jack, and Jack – as was his wont in those days – stopped to exchange a flirtatious glance with a slightly disheveled, attractive man in a woolly tank-top. At which point I stopped paying attention to the episode altogether. Tank-top-man didn’t have any dialogue, as far as I remember, but I looked at him and thought “Ooh you need your own story!” and body-snatched him for my own purposes. (The universe was about to end anyway, so it’s not as though he had much of a future where he was.) So UtH started off because I had a very clear picture of what Chris looked like (exactly like Tank-top-man) but absolutely nothing else. At that point I had no idea why he dressed like he was from the 1940s. I thought perhaps he was just deeply, rebelliously uncool, but it came in very handy when I added the WWII backstory. Unnamed air crew. They look so YOUNG! Elin: The Second World War is a big leap from your Age of Sail novels. Do you find similarities between the conflicts or is it the differences that attract you? Alex: I think it’s the similarities. I love my big war machines. With the Age of Sail I fell in love with the ships first, and then with the complex and fascinating microcosm of a world inside them, where the men who sailed the ship were something like a small clan or a big family to each other. They were shut away inside this war machine, miles away from anyone else, relying on each other – on the small and heartbreaking acts of every day kindness that humanised the terrible conditions – to keep their courage and stay sane. Just like a tall ship, a Lancaster bomber was a beautiful, brutal weapon of mass destruction. And the crews were locked even more tightly into small units held together by friendship and mutual trust and bonds of dependence that made them closer than families, with everyone trying not to show that they were afraid in case it made their mates afraid too. It was the stories of the crews and the way they bolstered each other through nightly terror that really made me fall in love with them – the comradeship and the love that turned a nightmare into something that could be endured. Not really WWII per se, not really the 7 Year War per se. Just the bombers, just the ships. Elin: Everything is better with elves. Discuss. More elves because I like elves! Alex: I’m not sure that real life is better with elves – we evidently pushed them out of their world, we don’t understand them, and they have some sort of power over time and over the minds and souls of humans of which we don’t know the full extent. So… in real terms that adds up to something you’d have to be a little wary about. Also, as I was growing up, there were *way* too many Tolkien knock-off novels and films which didn’t have his subtlety or rooting in folklore, and made their elves so understandable, so un-alien, that they were basically just handsome human beings with pointy ears, who were good at archery and spouting New Age phrases about the wonders of nature. I think we’re better off without them too. On the other hand, proper elves – elves who are really alien, hard to understand, ambivalent, tricksy, beautiful – elves who make your head hurt and your skin crawl and your heart sing… Everything’s better with them. But they’re very rare, and despite many of us trying to write them, they stay rare because they’re almost vanishingly difficult to do well. Still worth trying, though. Elin: I understand that your current WIP concerns a family of Saxons at the time the Viking raids on England were just beginning. What aspects of the inevitably HUGE research for this novel have you enjoyed the most? Alex: Well, to be honest, I’ve been a Saxon reenactor for 21 years now, and really did most of the huge amount of research just for fun because I was interested. I had it on tap when I decided to write the novel, and will only need to brush up on specifics – who’s the Abbess of Ely at which date? Which king of East Anglia is it? What’s the Old English name of this village? Etc. But reenactment wise one of the most impressive things I managed to do was – while dressed as a man and with the rest of my raiding party – to row Regia Anglorum‘s longship up an estuary in Scotland, drive it into the bank, leap off and attack the watching crowd with an axe. I learned many things from this – boy is it hard work to row that thing against the tide. Boy is it a long way to jump down from the prow of a Viking boat onto rough grass while wearing chainmail and carrying a large wooden shield. But boy is it satisfying to watch a crowd waver and break and run from you like spooked horses from a bear. 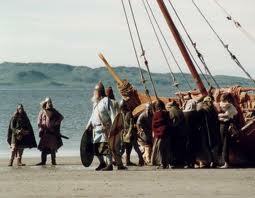 Much though I don’t like the Vikings, I can see the attraction of being one. 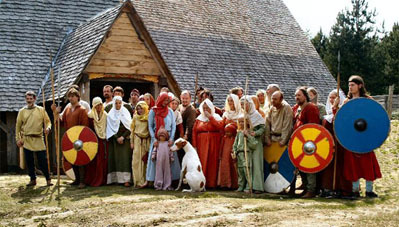 Actually the biggest thing I’ve done would be to help in the building of the society’s longhall in Kent, where we now have a little Saxon burh. Everything there has been cleared and constructed by the volunteer labour of members of the society. And although it was rather too much like hard work to be most enjoyable, it’s probably the most satisfying. Elin: What makes a hero? I’ve noticed that some of yours have some pretty substantial character flaws to surmount. Is there any one thing that they have in common? Alex: What makes a hero? Blimey. You know, that’s not a question I’ve thought about before. I guess a hero (as opposed to an ordinary person) is someone who – if something is wrong – doesn’t wait for someone else to fix it, but goes and does it themselves. And a hero, (as opposed to a villain,) is someone who respects others and allows them their own agency too. Beyond that, I think that heroes can come in any of the infinite varieties in which human beings come. Character flaws don’t make you less of a hero – standing by and doing nothing when someone is being hurt, or something bad is happening, taking other people’s choices away from them, disrespecting them for not being the same kind of person you are – those things make you less of a hero. Elin: NICE answer! I asked Erastes this, so I sort of have to ask you, just to be fair. J Of all your characters which ones would you ‘dump, snog or marry’? Failing that who would you be happiest to have as a next door neighbour? From my published books, the one I would probably throw out of a window would be Captain Walker from Captain’s Surrender. Tancred from The Witch’s Boy is a more thorough-going villain, but at least he knows he’s bad. Walker has that particularly self-righteous religious hypocrisy that’s so hard to stand, and would try to run the local Neighbourhood Watch and report all the local kids to the police for smoking dope and talking on street corners. Who do I think is sexiest? That would be Jasper from The Wages of Sin. Definitely the most sensual character I’ve managed to write. Most of my characters are controlled firmly by their intellects. Jasper is probably the only one who does most of his thinking with his body first. He’s much more raw and visceral than the others. Garnet from Blessed Isle gets an honourary mention, though, with his flamboyance and his high class ways and his tendency to laugh at everything. I think he would be a hard man to resist. Who do I think would make the best husband? Oh, tricky. Of all my heroes, Peter Kenyon from Captain’s Surrender would be the worst husband – he’s so self centred and oblivious, but Josh is very understanding and can cope. Alec and Darren from Shining in the Sun will probably continue to flap and panic about everything for the rest of their lives. They’d drive me mad, but they suit each other. Alfie… being jealous by nature I wouldn’t like his wandering hands (though I know he has no real intention of acting on it.) John Cavendish from False Colors would be very sweet, very attentive, very serious. He’d suit me, though he might not suit someone who needed more liveliness and humour. Chris from Under the Hill would be a good husband in the old fashioned sense – he’d be a good provider and a comfortable companion, but he’d have a tendency to fill the house with bits of oily dismembered machines, and run off down the pub if you complained about it. Ben would like to say that he’s only just got his head around the idea of being boyfriend material, ask him again in ten years. Elin: I actually live with a Chris type – only with him it’s sawdust, woodshavings and linseed oil. 🙂 Thank you very much for answering my questions so tolerantly! And the very best of luck with Bomber’s Moon. I think it’s fantastic! For anyone who doesn’t know – Alex’s website is here and links to Buy Bomber’s moon are here! When Ben Chaudhry is attacked in his own home by elves, they disappear as quickly as they came. He reaches for the phone book, but what kind of exterminator gets rid of the Fae? Maybe the Paranormal Defense Agency will ride to his rescue. Sadly, they turn out to be another rare breed: a bunch of UFO hunters led by Chris Gatrell, who—while distractingly hot—was forcibly retired from the RAF on grounds of insanity. Shot down in WWII—and shot forward seventy years in time, stranded far from his wartime sweetheart—Chris has been a victim of the elves himself. He fears they could destroy Ben’s life as thoroughly as they destroyed his. While his team tries to determine what the elves want with Ben, Chris is more than willing to protect Ben with his body. He never bargained for his heart getting involved. Under the Hill: Dogfighters will be published on the first of May! And how appropriate is that? So great to see UTH in print, or in digital anyway – I’ll be waiting for them in paper because i want them on my shelves! Great answers! Thanks Erastes! Yes, it’s felt like a very long time between books. 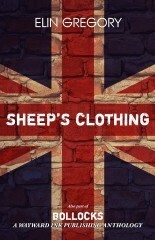 It’s nice to have something new out. I know what you mean about paper. I can’t wait for them in print either – it just feels that much more real when you have something to hold. Nice to meet you Alex! That’s a wonderful interview, well done. My dad was on the Lancasters in WWII and I adore elves in any shape or form. So I think I’ve got lots lined up to read. I’m actually reading “Shining in the Sun” at the moment and am so impressed by the way you evoke the atmosphere. I can almost taste it, it’s so good. Nice to meet you too, Sue 🙂 And thank you! Elin asks really interesting questions, so there’s no difficulty thinking of something to say in return. I hope I have not let your dad down with this. I certainly have nothing but admiration for the Bomber Boys, who don’t get the praise they deserve, I think. Eee, and I’m delighted that you’re enjoying Shining in the Sun 🙂 I wrote it in an attempt to package up a Cornish summer holiday for permanent enjoyment, so I’m really glad if that works 🙂 Thank you! Thanks Xarminta! In the interests of full disclosure, I should probably confess that it’s a Saxon novel only, though. No Vikings except for a brief cameo appearance. Sorry! Yay! Now I’m trying to sort out “dump, snog, or marry” for my WIP, and it’s very nearly impossible! I like your thoughtful answers. *g* Thank you! But yes, I don’t really relate to my characters like that. It’s more a case of who would I most like to be? Thanks so much for having me, Elin 🙂 And yes, my husband is a bit of a Chris-type too, although in my case it’s dismembered computers around the house, and rusty bits of cars on the drive. To his credit, though, when he goes off down the pub, he takes me with him. *hugs* Your answers are brilliant! Thanks Jessie 🙂 They are magnificent planes aren’t they? Quite small by today’s standards but somehow they still feel like a big beast of a thing when they go overhead. I’m another waiting for print. Will these be in one volume, or separate? They are in two volumes, mainly because the economics of POD would have meant one volume would have been too expensive to produce. I should write shorter books, clearly! NO! Write ’em until they’re done. You don’t pad. I do apparently put more description in than most people want, but I do that because I regard description as one of the good bits. I certainly don’t deliberately pad. I’m not entirely sure I would know how. But I could cut down on subplots. It would have been half the length if I’d left Flynn out. I’m so glad you didn’t leave Flynn out. It really racks up the tension to see what he’s going through in Elfland. Also I like description. I guess it takes all sorts.